Childhood tooth decay (cavities) is one of the most common preventable diseases. Children as young as 12-18 months can get cavities. In baby teeth this can cause pain and even prevent children from being able to eat, speak, sleep and learn properly. Children do not lose all their baby teeth until they are about 12 to 13 years old. The good news is cavities can be prevented with early dental visits, fluoride, regular brushing, flossing, and healthy diets. First Smiles (Really Do) Matter! The First Smiles Matter Program (FSM) provides free dental screenings and topical fluoride treatments for children ages 0-5 years. Those needing help finding a dental home or needing assistance enrolling in government insurance can contact our office and we will direct them to the available resources. Pregnant woman may also receive a free dental screening and oral health education about caring for their oral health, as well as their new baby’s oral health. All screenings and preventive treatments are provided by licensed medical or dental professionals in childcare centers, preschools, and other places where young children and their families visit. Our Program also offers education on “Oral Health in Early Childhood” to medical/dental professionals, students, parents, and childcare staff. Our trained program staff can help childcare centers implement a tooth-brushing program to help children build good oral hygiene skills at a young age. First Things First (FTF), approved by Arizona voters, works to ensure that our youngest children have access to quality early childhood experiences so they will start school healthy and ready to succeed. The First Things First, North Regional Partnership Council and South Pima Regional Partnership Council, bring First Smiles Matter Program (FSM) to our community. Pima County Health Department’s Oral Health Program coordinates this program along with other community partners provides services in designated areas of Pima County. Desert Senita (Ajo) and El Rio (Tucson), Marana Health Care, Community Health Centers’ dental staff, and other partners in the FSM Program collaborate in this effort. Preventing Cavities with Dental Sealants! Dental sealants are clear or tooth-colored plastic coatings that are applied to the surfaces of healthy permanent molars to prevent cavities in hard to clean surfaces of the teeth, where food and germs can easily get trapped and cause tooth decay. Pima County Health Department's Oral Health Program has been providing services in the Arizona School-based Dental Sealant Program for over 10 years! Our program provides dental screenings and sealants to 2nd and 6th grade children, attending qualifying schools, at no charge to school or parents. The screening and sealant application process is done in less than 30 minutes, by licensed dental professionals, while the children are at school. More than 50 schools in in our local unified school districts, Amphitheater, Flowing Wells, Marana, Sunnyside, Tucson, and some Charter schools participate in this valuable program. Interested schools can call to check their eligibility and get additional information by contacting the Arizona Department of Health Services, Office of Oral Health at (602) 542-1866. For a current list of participating schools, click this link. 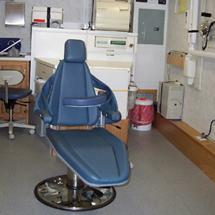 The Pima County Mobile Dental Unit, owned and operated by the Pima County Health Department, is a 36ft. Airstream motor home converted into a two chair clinic with state of art equipment and is wheelchair accessible. Currently, the mobile dental unit travels to various elementary and middle schools in the Amphitheater, Flowing Wells, Marana, Sunnyside, and Tucson Unified School Districts with the Arizona School-based Dental Sealant Program.